What are the Digital Skills Management challenges? People, their skills and experience, have become a critical aspect for the operations of companies with a dependency on Information & Communications Technology. Over the last few decades we’ve experienced a digital revolution which has moved through a phase where the technology was behind-the-scenes or ‘back office’, often supporting business processes but with a manual workaround for when the technology broke down. Now we find ourselves in a place where the technology is critical and very visible, especially when it goes wrong, and there is often no viable satisfactory manual workaround. Companies regularly make the press for very negative reasons such as data theft and cybersecurity breach, or loss of service due to a technology or project failure. This can have significant brand and revenue impact, with these companies losing customers, and sometimes facing fines and legal action. The impact of technology-related issues is increasingly catastrophic. There is often a lot of focus on the technology itself, however investigation of these issues often reveals the root cause is not having the right people, with the right skills at the required levels, in the right roles doing the right things. Technology professionals, and the IT industry in general, are often quite comfortable with the technology aspects, but less experienced when it comes to people and skills. Many companies have been implementing Human Capital Management (HCM), Talent Management, or HR systems across their workforce, and they work well for covering several generic people management activities and processes. However, we’ve been working with a growing number of companies who find that this doesn’t provide what they need for more specialist resources – in this case, those with Digital, ICT, Cybersecurity and similar technology-focussed skill sets. In these situations, they are augmenting the company-wide general solution with some specialist capability, which can be integrated through APIs and other interfacing methods if required. Each profession or specialism has its own unique practices and skills, and you do need to get into these details for a number of good reasons. A Medical professional could be a General Practitioner or Consultant Neurologist – you would want to be specific about the skills and experience requirements when deciding who to let loose with a scalpel for brain surgery. The technology field is no different – even resources with the same Job Title in the same company might have very different skill sets. Several times I’ve come across two Business Analysts in the same company – one who does nothing but produce business requirements specifications, and another who does this but also creates acceptance test criteria and contributes to business cases. Despite them both having the same job title, the skills and the levels of those skills are a very different mix for each of these individuals. This is an area that many haven’t started, some are struggling, and few have addressed in a reasonable way. As with any journey, you need to know where you’re starting from. 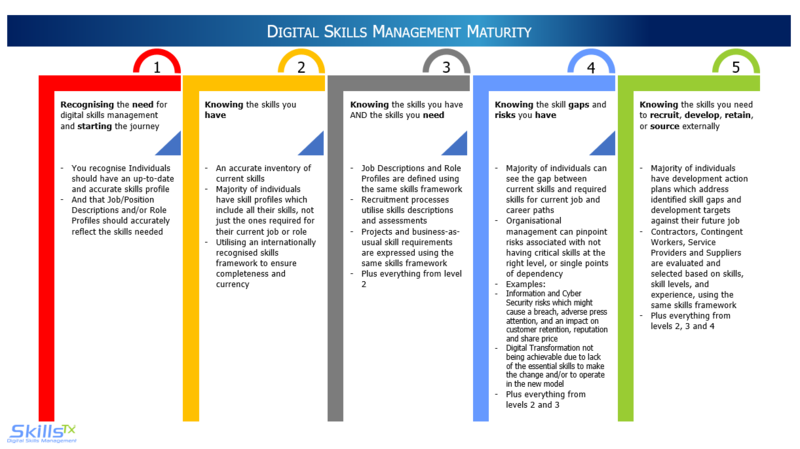 This Digital Skills Management Maturity model should help you to identify where you are now, where you want or need to be, and what are the key characteristics which would be expected at each level. How mature do you need to be? We don’t yet live in a world where technology requires zero input from humans at any stage of design, build, implementation, operation, support or use – so we continue to be dependent on people, their skills and experience. Think about any issues you’ve experienced within your company, or anything that has made the press – I think you will find that the majority involved some human activity, whether in causing the issue, resolving it or preventing it in the first place. In this competitive world, where the types of skills we’re talking about are become even more critical, and many are reporting difficultly in recruiting or retaining the skilled resources they need, I would argue that being at level 1 of this maturity scale is going to be extremely uncomfortable and difficult to defend. Ask any C-level executive, board member, or senior manager if they are content not having a clear view on what skills we have and what skills we need. At SkillsTx we’ve built in the DSM Maturity scale to the Analytics function, so organisations can see where they currently are. If you don’t know the answer, or you are not at the maturity level you think you need to be, schedule a quick chat with us. You can also watch a short presentation that describes Digital Skills Management Maturity (DSMM) HERE.